For more information and updates, follow the discussion over @ OpticsTalk. Utilizing the Illuminated Mil-Quad DM reticle in the second focal plane gives you better target acquisition in CQB scenarios while maintaining its ability to range and provide aiming points at max power. The new Illuminated Mil-Quad DM Reticle has built in aiming points for 100, 200, and 300 yards for most 5.56 and 7.62 rounds. It utilizes a Mil based reticle and has the ability to provide the shooter with accurate target distances utilizing the built in target ranging references. The ranging references can be used to range various objects in various sizes. You can range anything 72", 36", or 24" tall as well as any object 18" wide. This gives you the ability to range objects such as human silhouettes, IPSC silhouettes, deer, hogs or even coyotes. The exposed knobs have .1 Mil Adjustments per click and 5 Mils per revolution. The power ring comes threaded for 3 different size throw levers, 5mm, 10mm and 15mm all of which are included. These give you the ability to rapidly zoom in and out and are customizable to fit each shooters preference. When you're looking for a scope that can accommodate all of your needs in a single unit NOTHING COMES CLOSE. I do not have previous experience with other tactical 1X scopes to compare against the SWFA riflescope, but I have several other quality hunting scopes. The packaging and instructions are spartan, but the controls and features are straightforward. The reticle is useful and the illumination levels are appropriate. I have astigmatism and the illumination produces no starring effect. The glass quality is as good as my best hunting scopes. +2 points to SWFA Customer Service: I ordered scope and mount separately, then discovered a bundle at a discount. The customer service representative refunded back the price difference. My only wishes would be caps or cover included, convertible adjustment knobs (internal or external), and less weight. I strongly recommend this very good product! I have this scope mounted on my PTR-91 with an ADM Recon Mount. I bought this scope under the impression it was manufactured in Japan, but it is made in the Philippines. There are not any problems with that, I assumed it was manufactured in the same factory as their SS10x42 scope. I have the SS10x42 and the SS12x42 scope and they are great. With that being said, this is also a good scope. The magnification adjustment moves smoothly and the turret clicks are tight and positive. The build quality is solid. While the illumination is not bright enough for daylight at high setting, it does work well in low light conditions. I love the off click feature after every illumination adjustment. However, it did lose a star due to the edges of the aperture appearing fuzzy at 4X when looking at a 400 yard target. Compared to a Chinese Vortex Strike Eagle 1-6X, the edges are noticeably fuzzier. Other than that, this is a good scope for the money. Outstanding scope. I'm not going to try to write an op-ed article or worse, a yelp review… the reticle is excellent, clear, and very easy to use, whether or not you know how to use milliradians, you're probably going to set up for your own PBZ anyway. The illuminated center diamond is very quick to pick up as are the pre-set 1 yard @ 4x ranging hash marks. Adjustments are precise as is zero return. Clicks have "excellent tactile and audible feedback", (is that still the current fashionable jargon?). I have 5 SWFA scopes and I don't regret buying one of them. I think the glass is excellent and the controls are extremely precise and repeatable on all of them. The quality and toughness of the build is outstanding in this and the other four SWFA rifle scopes I own. Once this company's name becomes tacticoolly fashionable, the prices will probably go up considerably. The SWFA 1-4X24 scope has most of what people want in a scope for an AR-15 or similar carbine. The manual does a good job of explaining the simple yet powerful ranging reticle. If you're already familiar with a mil-dot scope the reticle in this scope may not offer much more usefulness for the same ranging capability but is more cluttered looking, but if you want a more complicated reticle with more intuitive prompting and less to remember, and a faster target solution for "close enough" shooting as opposed to precision shooting, then this reticle is a lot like a Heads Up Display with all the ranging info you need without the need to remember the height and width of various common target objects in mils. This scope is built like a tank, has solid tactile clicks on the elevation and windage turrets, and good optics as expected for Japanese glass. 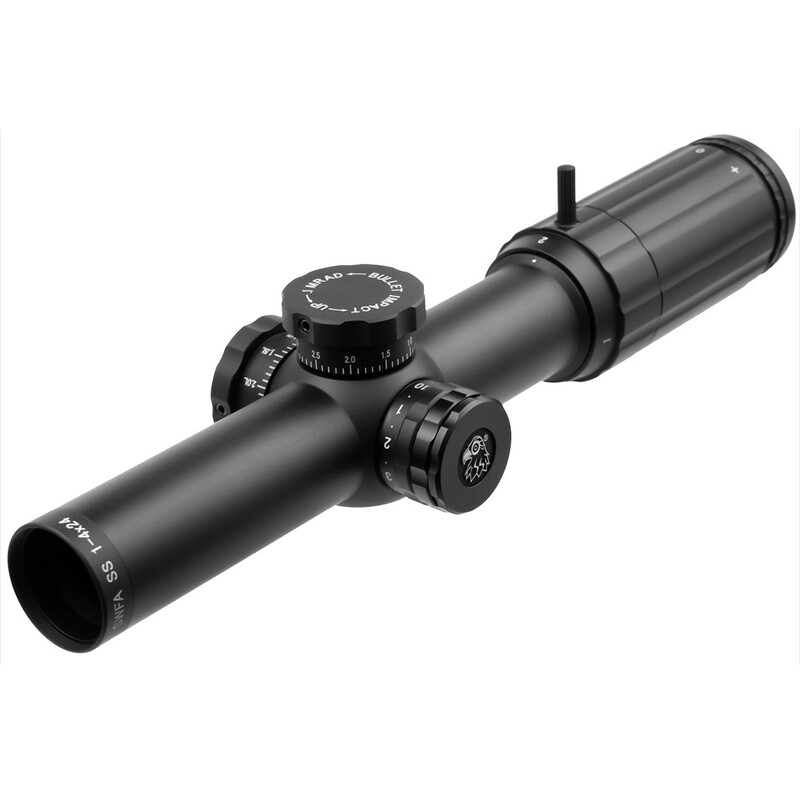 This is a cut or two above the typical $250 scopes with similar features, although some of them do have lifetime warranties. You'd probably need to pay twice as much to get a better scope for the intended application. I also like the attention to detail, such as the storage for a spare battery under the battery cap. If you want a better tactical scope than the $250 competitors but you don't want to spend much more than that, this may be as good as it gets. Be sure to see if a bundle is offered with the S.S.A.L.T. mount. If so, it's probably a better deal overall. Bought this scope almost 2 years ago to use for 3 Gun matches and it works great. I have absolutely beaten the snot out of this thing and it holds zero. Targets are clear and crisp. I have 0 issues engaging targets from 3 yards to 300 yards. 4x zoom is a bit under what most of the others are running, but I'm still competitive with them and a few are looking to get this for themselves or friends after looking through mine. Not super heavy, built like a tank, and super clear. Not much more needs to be said. On the upper end of 400$ will get you.